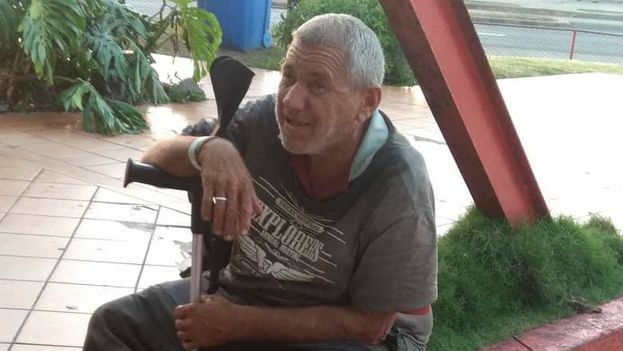 14ymedio, Justo Mora / Mario J. Pentón, Cienfuegos / Miami, 19 January 2019 – More than twenty beggars and elderly people were picked up by the police in the streets of Cienfuegos and sent to the Psychiatric Hospital. The authorities wanted to prevent those poor people from “wandering” in the city during Thursday’s visit by the Head of State, Miguel Díaz-Canel. Various testimonies collected by 14ymedio in Cienfuegos gave an account of the “cleaning” done by the forces of order with a bus that picked up the elderly who were on the Boulevard and other central zones of the city. “My aunt was picked up on Wednesday, they manhandled and beat her, she still has a bandage on her leg and bruises on her face and mouth. Osniel Gómez, a policeman on the Boulevard, told me that the round up was due to the arrival of Díaz-Canel,” Martha Galán Cañizares, niece of Natividad Cañizares, reported by telephone. Galán said her aunt appeared drugged when she picked her up at the psychiatric hospital in Cienfuegos. According to her, nobody could tell her who was responsible for the old woman’s injuries. “My aunt raised me since I was a baby. Imagine the amount of medication they gave her that she did not even recognize me. When I told these things to the police they wanted to arrest me,” the woman added. Although she thought about staying in front of the headquarters of the Communist Party to show Diaz-Canel what had happened to her aunt, Galán feared for the consequences. “My fear is that afterwards they will continue harassing her. My aunt does not get involved with anyone. She is well mentally, the only thing is that she likes to walk around the city and while she is healthy I think she should do it,” she said. Díaz-Canel visited Cienfuegos last Thursday as part of a tour that has taken him to several provinces in the country. The media presence of the president, appointed by Raúl Castro in April 2018, has grown exponentially. He visited the glucose factory, the university, the provincial hospital and the amusement park, as well as holding a meeting with the principal leaders of the region. The social networks publish more and more photos and videos of Diaz-Canel strolling through the streets of the major cities and small peasant villages, where people approach him to pose problems of all kinds. “Every time a high-level visit comes, the police and the Ministry of Public Health pick up the dirty-looking people who roam the streets and take them to the Psychiatric Hospital,” says a source at the Municipal Social Security Directorate who requested anonymity for fear of reprisals. “The worst of it all is that they pick them up for a few days and then release them again on the streets without any type of asistance,” he added. According to the same source, during Díaz-Canel’s visit at least twenty beggars and “wanderers” were picked up. Arelys Silva, who lives in the vicinity of the Calzada de Dolores, one of the city’s main arteries, is “outraged” by the abuse of the beggars. “Everybody knows that they take advantage of the fact those people have no one to defend them and they commit all sorts of injustices against them.” Since the arrival of Díaz-Canel, the entire scene was set up to show that things are all wonderful. These people live in a lie,” she said. Silva says she is still waiting for Díaz-Canel to “bring back the quality” of the flour with which they are making bread or to change the filters of the city aqueduct so that the water does not arrive “with a chocolate color”. “We have lived through decades of promises and calls for resistance but we continue with the ration book and ’eating chicken for fish’*,” she lamented. *Translator’s note: “Eating chicken for fish” is a widespread complaint about the rationing system. Cubans can buy limited foods through their ration booklets at very low prices. The allocation is supposed to include fish but, as it almost never does, chicken is substituted. There is no explanation for why, on an island surrounded by water, fish is never available.